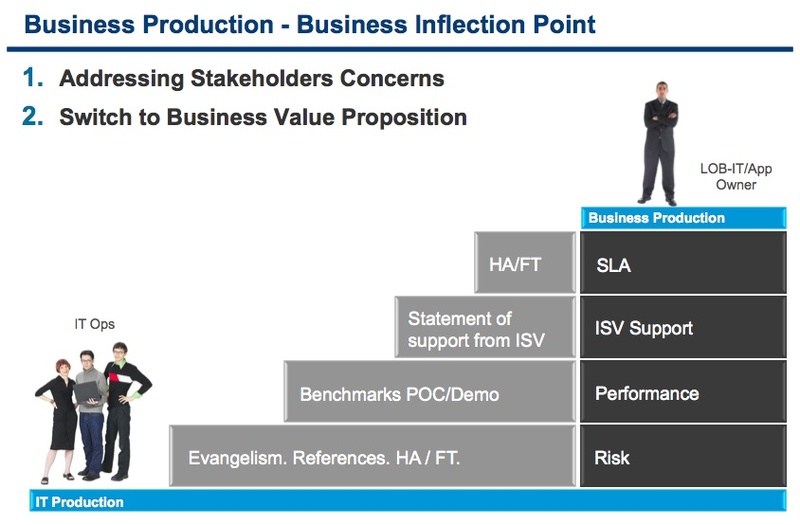 Let’s now double-click on the Business Production phase. Third, they get hit by a big major trigger. For example they buy a new company and they need to integrate the assets, or they are about to have to build a new data center and that pushes them to the next phase. 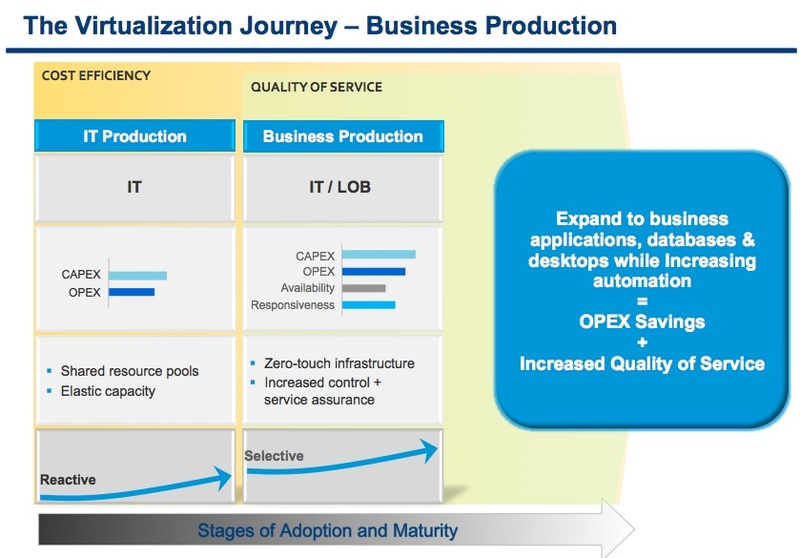 The next phase is what we call business production and we call it business production because this is when a customer virtualizes their first mission critical application or database. Customers in this stage are in a different league because they need to learn a whole set of new tricks, they need to learn how to deal with application owners. This transition is not always easy and the reason why this is a chasm for most customers is that all of a sudden, IT organizations go from virtualizing what they own to virtualizing business applications that are owned by somebody else. That somebody else is typically an application owner or line of business IT and those guys sit at the top of a pile of concerns of which saving money on servers is not the top priority. They are concerned with risks, performance, ISV support, uptime, business continuity… and so on and so forth. We find that as customers transition through this phase successfully, these concerns will go away over time and they get into what we call, “resistance is futile” phase your application will be virtualized and we are not even going to tell you. There are a lot of customers that do this, but it’s a transition. They need to get comfortable, learn how to use features like HA, FT, SRM, and so on to address the line of business owner concerns. Once the information about initial successes gets around, the push back from application owners and database administrators goes away. Sponsorship from the CIO always helps. Capex savings are still a factor but it is like customers at this point take them for granted and move their attention to building a better environment for business applications and databases to run on.